OUR MIDDLE SCHOOL CURRICULUM is a cross-cultural, balanced syllabus that combines grammar, vocabulary and everyday language with interesting and modern topics. There is a strong emphasis on oral communication and open conversation. Students are encouraged to talk about the things that interest them, while applying their language acquisition to cultural themes and providing them with the context within which to better understand western culture. The curriculum is divided into four levels: a starter level for students with minimal English skills, followed by three progressive levels for students entering our program with basic English skills. Most students who have not taken our primary school program will start at either the starter level or level 1. Graduates of our primary school program will start at Level 2. This six level series has a proven methodology with a focus on grammar, a clear vocabulary syllabus, and integrated skills work. Students receive a book and Student Practice Multi-ROMs with access to online TOEIC, TOEFL, and IELTS practice tests. American Headway 1 provides a foundation in the structure of the language by gradually building students' understanding of basic grammar, vocabulary, and functions of English. Universal topics are selected from a wide variety of material, and a systematic vocabulary syllabus includes dictionary training and work on systems, such as collocations. Grammar is also treated in-depth, and pronunciation work is integrated at appropriate points. The "Everyday English" section provides practice for functional language and social English. American Headway 2 builds on the firm grammatical, lexical and functional foundation laid in American Headway 1. Students' understanding of English is widened and their abilities to use the language for communicative purposes are extended. 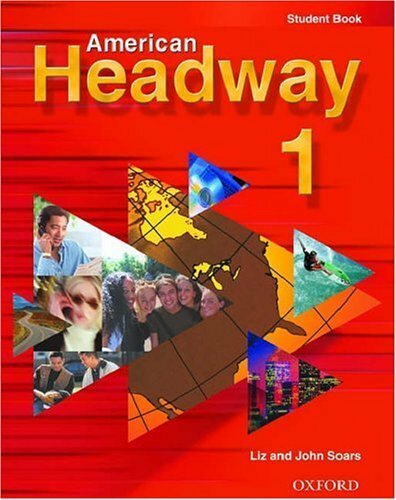 American Headway 3 completes the language-learning package for American English students at the intermediate level. The clear, modern design and international focus on texts and topics give the course universal appeal. Each unit offers a wide range of activities and encourages a sense of real progress through the course. Active analysis of grammar through "Test your grammar" and "Grammar spots" builds and extends students' knowledge. Culture Classes are windows into western and English speaking cultures around the world. The classes aim to share unique aspects of life, news, current affairs, and popular culture in an engaging and highly interactive way. Personal responses to articles, songs, videos, festivals and events are encouraged, and student's unique insights and opinions often contribute to lively and unpredictable classroom discussions. The classes prove a useful avenue for students to practice their productive skills, in particular speaking.